Human rights are increasingly described as in crisis. The rising populist tide that puts nation, religion, and race first poses new kinds of threats to human rights. But are human rights, underpinning the universal order of justice, really on the verge of disappearing? It is certainly the case that many human rights institutions have become more bureaucratic and stodgy and that human rights organizations in many parts of the world are under threat. Yet the appeal of human rights has always resided in the ideal of justice, fairness, and equality that they represent. These remain appealing ideas globally, even if the institutions designed to promote and enforce human rights are in themselves increasingly unable to do so. Recognizing the continuing importance and strength of human rights requires looking for them in different places. These places are not simply the Human Rights Council or the regular meetings of the treaty monitoring committees, but also the offices of small NGOs and the streets of poor cities. Understanding human rights in practice requires looking at the way the ideas they promote have become part of everyday life for many people around the world. And even though there has been a great deal of sophisticated and valuable scholarship about whether human rights are ‘effective,’ measured ‘effectiveness’ is not the only way to evaluate the importance of human rights. After all, we do not judge the value of national laws because they are effective, but because they articulate goals that we would like to make effective. Most—national and international—laws, in fact, have an impact in the absence of sanctions, operating instead on the basis of voluntary compliance with a set of rules and ideas that people (or collectives) come to accept. But they are also routinely violated. Lack of compliance with these national laws is not viewed as an indication that the cultural project has failed. We can also think about human rights law and human rights norms in this way. As such, human rights should not be considered merely as a matter of international law (if this was indeed ever possible), and neither a focus on violations nor work on the justiciability of human rights adequately represents the broad range of human rights activism that seeks to address the structural factors constraining the enjoyment of human rights. As scholars have demonstrated, dynamic and decentralized engagement with various aspects of human rights quickly proved that the assumption of a more or less monolithic human rights understanding was, in practice, an illusion, and the adoption of human rights discourses by a growing range of actors resulted in various partial, innovative, or biased articulations of this discourse. This evolution led to questions as to whether there are limits to how much transformation on the basis of ‘voices from below’ the existing human rights architecture can accommodate, and whether there are cases in which risks (of co-opting, fractionalization, or offering less protection, for example) outweigh potential benefits of inclusivity and local ownership. This debate has gone on to question whether there is a need to define an ‘untouchable’ normative core that is beyond transformation, and if so, what constitutes such a normative core, how it can be identified, and whether it will ever work as a red line that cannot be crossed? Are there good and bad forms of transformation, or should this normative characterization be forsaken altogether? How do we understand the choice of organizations to use human rights language even when claiming rights that are not inscribed in human rights law? If certain permutations by grassroots human rights users are deemed unacceptable, by whom and on what grounds should this be decided? These descriptive and normative questions may be impossible to answer in the abstract. Our recent volume on how these transformations of human rights takes place in practice, seeks to answer them in concreto. Human Rights Transformation in Practice brings together scholars from various disciplines in order to broaden and deepen our understanding of how these ideas about human rights travel and how they are translated and transformed along the way. One of the case studies in the volume is on the right to health. Sara (Meg) Davis and Charmain Mohamed show how activists working in the context of a sweeping crackdown on civil society must become skilled at managing political risks of many kinds. This can influence their strategic choices with regard to the translation of human rights. Chinese activists working on the right to health showed pragmatism, sophistication, and reasonable caution in the selection of their advocacy targets and tactics, and prioritized the opportunity to deliver real and measurable gains for their communities. The authors assert that human rights activism is still largely constrained, leading many HIV/AIDS NGOs to adopt service delivery programs, rather than engaging in critical and open advocacy. Davis and Mohamed ponder the question of whether this type of engagement with service delivery, and with rights holders’ immediate and practical needs, allows for a critical stance on government policy. If not, what does it mean when these organizations adopt human rights discourse, while condoning the actions of, and collaborating with, a human rights–violating government. This is also true for Destrooper’s case study on the right to water in the Democratic Republic of the Congo. The case studies raise pertinent questions. What happens to a social movement’s formulations of injustice when these are reframed as rights claims? How do movement leaders and external allies collaborate in identifying which claims to prioritize in redefining them in terms of international legal norms, and in deciding the mix of methods to pursue? Does juridification inevitably entail a narrowing of social movement claims? And, if so, does such narrowing signal a shift in movement agendas from socially transformative to reformist aims? How may the very content of social justice struggles change when community membership organizations translate liberation agendas into legal terms with the aim of upstreaming them? What is the role of grassroots work, and how can we understand why some grassroots groups deliberately decide not to engage with human rights discourse? Human Rights Transformation in Practice offers new perspectives on the nature of human rights and how they work in the world. It foregrounds the sets of ideas and practices generally labeled as human rights, that travel, become translated, and are transformed as they are appropriated, adopted, and redefined to fit particular social issues and struggles. 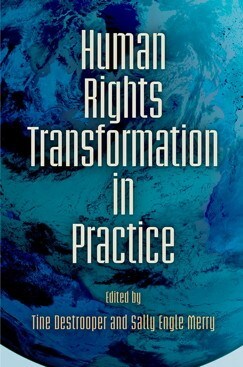 It demonstrates that a focus on how human rights travel and how they are transformed offers an invaluable corrective to those perspectives locating human rights only in formal institutions and laws. It shows how human rights are embedded in everyday social practice and activism. It challenges the idea that human rights are an entirely Western construct resisted by the postcolonial world by showing how these ideas are appropriated around the world and how the international human rights norms and architecture are shaped by different countries’ experiences. And it makes clear that although measuring compliance is important, this is not the only way to assess what human rights do. By examining the human rights system as a social justice ideology with universal aspirations, flexible enough to be reinterpreted and redefined in a variety of contexts and for a broad range of problems, it is possible to develop a more comprehensive and useful understanding of the way human rights work in our contemporary world.